Friday Funny – Paul Ehrlich's review of Steyn's book on Michael Mann's work | Watts Up With That? Paul Ehrlich (yes THAT Paul Ehrlich) recently posted a review about Mark Steyn’s book A Disgrace to the Profession on Amazon, and after reading Ehrlich’s review, my irony meter pegged, the needle flew off the scale and embedded itself in the wall of my office, nearly missing our resident member of the Union of Concerned Scientists. Well, perhaps he’s right, I assume everybody at his own echo chamber website Real Climate does admire Dr. Mann, the rest of science, eh, not so much. Otherwise, they would have come to his aid and filed amicus briefs in his court battle with Steyn. The thunderous silence of science in support of Mann speaks volumes. Gosh, it looks like a hockey stick, doesn’t it? Unhappily the “triumph” may prove doom for many of our descendents. 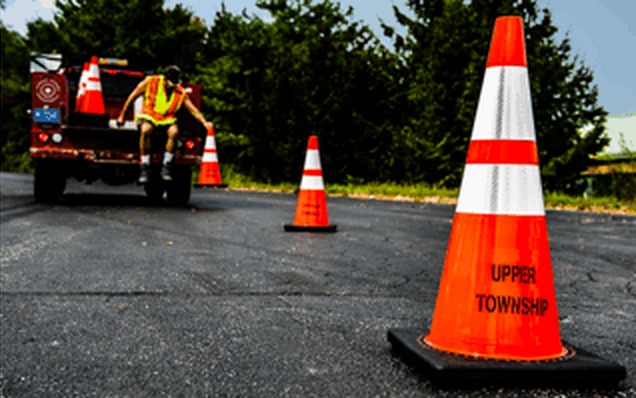 The egos on these folks must be so large that the department of transportation must set out orange road cones ahead of them when they travel, so that they have a wide lane of their own. Your best pushback against these people? Buy the book and decide for yourself. Order it on Amazon here. Note: about 5 minutes after publication, this article was updated to fix some spelling and formatting errors. November 13, 2015 in Book Review, Humor, Michael E. Mann, Satire. Unfair! You know that Real True Scientists like Paul “Often Wrong, but Still Quotable” Ehrlich get major cooties when they read things that don’t fit into their paradigm. How can you ask him to risk cooties? I think your question can be answered by inquiring if Mark Steyn was from Stanford or Berkeley. Best first comment of the year. Obviously your sarc is on. Maybe you’d recommend posting a “sarc” about a “snark” but it appears Eugene agrees, as would I. Or is your sarc on? One can speculate as to whether or not Ehrlich read the book. However, what requires no speculation is that Ehrlich points to not one instance of “quotes-out-of-context.” Neither does he identify a single example of these so-called “hacks and has-beens.” His review is as pathetic and vacuous as climate science itself. David, UK, I’ve pointed out a multitude of out-of-context quotes, as well as misquotes and even a quote misattributed to a guy’s kid. I didn’t compile the notes I posted into an organized review because whenever I tried to discuss these issues, nobody seemed to care about them. I got tired of “skeptics” not caring about misdeeds because they liked the guy who did them and decided it wasn’t worth repeating the same points over and over when they’d just get ignored. But if you want to argue the issue, it’s trivially obvious Mark Steyn took quotes completely out of context to distort their meaning. It’s not even a challenge to show this. As in, the best thing to do is to just not talk about the issue because anyone who looks at it will see how obvious it is he did it. Apparently that link got mangled due to WordPress not accepting links without http in front of them. I don’t know why it doesn’t accept ones that just start with www, but here’s what should be a working link. 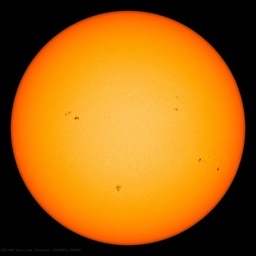 Over the last 10,000 years it has been warmer than today 65 per cent of the time. was talking about the planet’s temperatures when the guy was really just talking about the temperatures as estimated via three glaciers in one mountain range. Steyn then immediately turned around and in, a stupifying fit of hypocrisy, condemned Michael Mann for drawing conclusions about the planet’s temperatures via a small number of trees from one portion of North America. That’s right. Mark Steyn took a person’s quote out of context in order to do exactly what Michael Mann did – draw conclusions about the planet’s temperatures from a tiny amount of data from one small part of the world. Whether or not the Holocene was warmer in the past has no bearing on this issue. Mark Steyn portrayed a quote as speaking about the planet’s temperatures when it only spoke about temperatures for a small region. Not only does this mean Steyn misrepresented what was said in this quote, which he begins his book with, it also means Steyn has effectively used a tiny amount of data from one area to draw conclusions about the planets temperatures – exactly what he condemns Michael Mann for doing. There is no justification for this. Skeptics should all agree this was wrong. People could perhaps argue as to how important this error is, but… come on. This was the first sentence of Steyn’s book! How is nobody saying, “Hey, that’s wrong”? Maybe some warmistas should occasionally point it out and condemn it when other warmistas make ridiculous claims. Until that happens, telling skeptics what they should do is just more of the same one-sided crap we have been getting, nonstop and for several entire decades, from every single alarmist propaganda-spewing “climate scientist” that government grant money can buy. 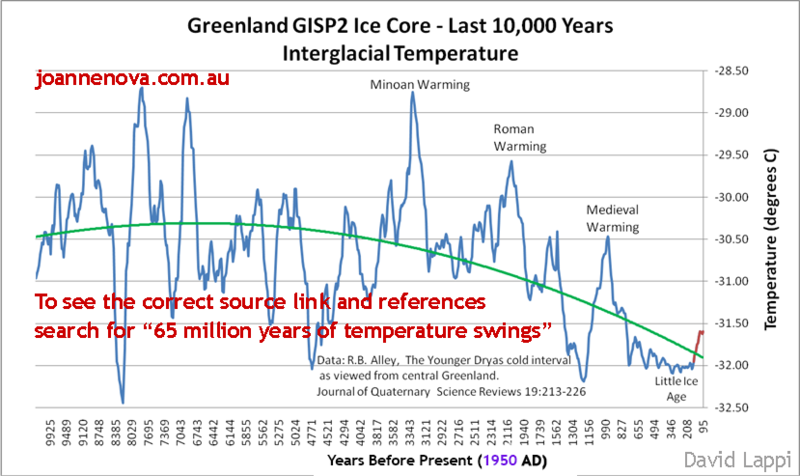 I already told you that that graph represents temperatures in central Greenland and contains a significant error because they have not been corrected for layer compression, yet you keep using it as if it represents Holocene temperatures. It does not. Do you still don’t know despite being told or is it that you don’t care if you are in error? You are an easy target to alarmists. It is a global reconstruction from 72 proxies published by Marcott et al., 2013, but averaged by differencing to correct for proxy drop out at the end, and without the Montecarlo averaging that eliminates most variability. The temperature scale has also been corrected by me because the original was clearly incorrect in representing the temperature difference between the bottom of the LIA and 1961-1990 average (zero anomaly). Not only does this mean Steyn misrepresented what was said in this quote, which he begins his book with, it also means Steyn has effectively used a tiny amount of data from one area to draw conclusions about the planets temperatures – exactly what he condemns Michael Mann for doing. Well, that’s flat wrong. Mann deliberately misrepresented, while your example shows Steyn mistakenly saying something in error. Big difference. Thanx for you opinion. But your Marcott chart doesn’t show a whole lot different from the one I posted, and they both support Steyn. You also need to do a keyword search in the searchbox here for ‘Marcott’. His paper isn’t nearly as error-free as you’re assuming. I don’t go off mind-reading like you do so I won’t address your hand-waved claims offered without any evidence as to what people did and did not know. What I will say is the quote I provided from Mark Steyn was from a presentation entirely devoted to one mountain range, meaning there is no way anyone could view it and think it was about global temperatures. If you want to say Mark Steyn was stupid enough to look at a discussion which was obviously about temperatures for one area and somehow conclude it was about temperatures for the entire planet, fine. If you want to say Mark Steyn is just too lazy to look at what the quotes he puts in his book are actually about, simply grabbing any that look good, fine. Either way, it’s a damning criticism of Steyn and his book. YOu’ve repeatedly posted an image claiming it shows the planet’s temperatures were warmer in the past than they are now. You’ve apparently been informed, numerous times, of the same thing I’ve informed you of – that it’s not a global record, it’s a regional record. And despite this, you keep doing it…? This is flat-out dishonest. You are deliberately misrepresenting what the graph you post is. At this point there is no way you could possibly be unaware of the fact that graph is not a global record, but you keep posting it as one. It’s not an innocent error. You are lying. Stop it. YOu’ve repeatedly posted an image claiming it shows the planet’s temperatures were warmer in the past than they are now. I’ve posted more charts than you can possibly count. I have literally thousands of them in various folders. If there’s one in particular you’d like to see, ask politely rather than calling me a liar. And since you mentioned it, I’m curious: are you now claiming that past global T was not warmer than now? Brandon is right, too bad many refuse to acknowledge it. I would also add that pretending a single line on a graph of temperature represents anything global is either delusional or dishonest, perhaps both. Brandon is flat wrong. He is supposedly a mind reader who mysteriously knows the difference between someone like Mark Steyn being mistaken, and being deceptive. Brandon is presuming to know the difference, when he obviously doesn’t. If we had mind readers like Brandon we wouldn’t need juries. That’s such a bunch of self-serving nonsense that it’s surprising people want to nitpick what Steyn knew, while ignoring the preposterous straight upward ‘hokey stick’ produced by Marcott’s deceptive shenanigans (the red line). But Marcott has been so thoroughly debunked here that there’s no need to waste more time on it. A keyword search is there for anyone who wants to revisit his alarmist propaganda — or, they can just look at his bogus chart above. But Marcott has been so thoroughly debunked here that there’s no need to waste more time on it. You are so biased that you are incapable of looking at the data if it has the name of Marcott on it, and you keep using a regional graph saying that it represents global climate when it does not and you know it. Marcott’s publication has a number of issues. They changed the dates of some of the records, used an averaging method that exaggerated the final warming, and run a montecarlo that eliminated most of the variability. But the 72 proxies the reconstruction is made from are the best proxies available and have a global nature. Correcting the issues is very easy by using the original dates, and averaging by differencing. 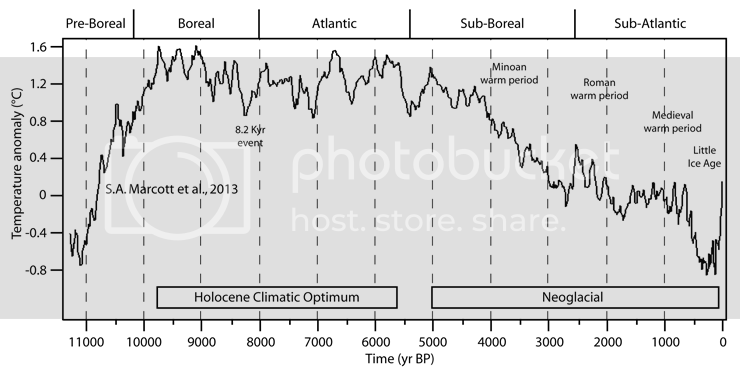 The result is the best global Holocene reconstruction available today, based on published literature, that I have provided to you. Whether it supports or not what Steyn says is beyond the point. You cannot extract global conclusions from a regional graph and pretend that you are science-based. And if Marcott is an alarmist, Alley is even more alarmist, but that is irrelevant, what is important is what the data says. And the data from Alley that you display as a truthful representation of Holocene temperatures has also an issue. As Vinther et al., 2009 demonstrated, delta18O data from ice cores in Greenland has to be corrected for elevation changes. They corrected Agassiz and Renland ice-core data in their publication. To my knowledge Alley’s GISP2 remains uncorrected and thus it shows lower values before 5000 BP that what were probably the temperatures in Central Greenland during that part of the Holocene. You have been told, you should learn. Otherwise you have confirmation bias, and cherry-pick and miss-represent data and are therefore irrelevant. You have been told, you should learn. But Javier never learns. He could not have read all the Marcott articles and comments, but his confirmation bias tells him he shouldn’t. Otherwise his head might explode from the cognitive dissonance. Its amazing that people like ‘Javier’ still believe, when the ultimate Authority, Planet Earth, is making a fool of those beliefs. And of the true believers. You have been told… I already told you… …& etc. You are not even aware of your strong confirmation bias, are you, “Javier”? Amazing. Until you identify yourself, "Javier", you're just another know-nothing anonymous screen name, and your opinions are no more credible that a Scientologist's. I don’t know. It doesn’t really matter. Either Mark Steyn is a liar, or he’s so intellectually vapid as to be indistinguishable from one. Either way, he grossly distorts the meaning of numerous quotes he offers in his book, including the one he uses as the very first sentence of his book. That’s a huge problem every skeptic should be bothered by. Look, it’s simple. If Mark Steyn didn’t know he was misrepresenting this quote, he must not have looked at where the quote was taken from. That means the only way Steyn could not be a liar is if he simply saw a sentence he liked the sound of and used it without bothering to check what the sentence was in reference to, not even reading the page he copied the quote from. Cherry-picking words to that extent requires a level of willful blindness that would be staggering. And he does it multiple times. This is just one example. If you want to claim Mark Steyn is just so incompetent he can manage to repeatedly cherry-pick people’s words to distort their meanings without realizing it… fine. Okay, whatever. That’s not any better than being a liar. In fact, it’s worse. At least if he’s lying you can respect his cleverness and intelligence. If he’s not lying, you’re championing a bumbling buffoon who makes a mockery of every one of you. I’ve heard that calling someone a liar in Parliament is forbidden. It’s an extreme attack that must be incontestable, IMO. But you throw out that term constantly, five times at least in that one comment, and not including your writing that Steyn is ‘indistinguishable’ from being a liar. I don’t agree that “the only way Steyn could not be a liar” is limted to your examples. I can think of others. And you are not the arbiter of what examples are acceptable, and which ones are not. It almost seems like you’re trying to defend Michael Mann, who has, shall we say, ‘fabricated’ some things in order to support his hokey stick chart. THAT is the central issue, not hair-splitting over what Mark Steyn may or may not have meant. I know you’ll say something like ‘but back on _____ I said “_____”.’ You are attacking Mark Steyn in a pretty reprehensible way, based on what you perceive. But your perception isn’t necessarily reality. If he’s not lying, you’re championing a bumbling buffoon who makes a mockery of every one of you. So that’s our choice — according to you: We are either accepting the word of a liar, or we are accepting what a “bumbling buffoon” says. Sorry, but no. I don’t accept your characterization. You seem a little less than rational. Certainly less rational than Mark Steyn (who I haven’t much supported, except for pointing out that he is a stand-up guy who didn’t fold like a house of cards when Mann’s lawyers attacked). Leaving aside the fact he just misquoted himself, which is all sorts of funny given this exchange began as a discussion of how quotations have been misused, this remark is absurd. This blog post is not about Marcott et al or its conclusions. My criticism of Mark Steyn’s book is not about whether Marcott et al is correct or whether some other conclusions are correct. My criticism is simply that Mark Steyn took a quote which was obviously about one thing and falsely presented it as being about another. I contend he did this multiple times, but I’ve focused on the time involving the first sentence of his book. dbstealey’s observation I didn’t answer a question is a transparent effort to change the subject from this simple point because he doesn’t want to deal with it. The question he asked has nothing to do with the issue I raised. It’s nothing more than a red herring designed to divert the discussion in order to avoid discussion of the fact Mark Steyn grossly distorted the meaning of quotes he used in his book. This blog post is about Mark Steyn’s book, but dbstealey is complaining that people want to talk about… Mark Steyn’s book. Aside from the fact that everyone writes their opinions here, and Brandon isn’t a self-appointed arbiter of those parameters as he seems to think, I was just commenting about Steyn’s guesstimate that 65% (IIRC) of the Holocene was warmer than now. I don’t know the exact percentage (and no one else does, either). He doesn’t need to. With his amazing predictive powers he is able to discern that all of the scientists quoted in the book are “hacks and has-beens”. ‘Cause he knows anyone who doesn’t agree with him is by definition a hack or has-been. The man is a god! \sarc (only in bizzaro land) Thanks for the laugh! Maybe someone sent him a photocopy of the book cover to read. Good for Steyn, being able to spin off books from the research for his law suits. Mann will regret picking on Steyn, if he doesn’t already. …nearly missing our resident member of the Union of Concerned Scientists. Well, I hope he meant “nearly hitting” because nearly missing to me means a hit. Well, we all have heard of a “near miss”; meaning “almost hitting”. Maybe this is just a derivative form. You forget this is the “Friday Funnies”, which Brandon is unwittingly or something similar, contributing so ably to. As in, bringing us a good laugh. I read Volume 1 and can’t wait for Volume 2! Yeah funny, but people really do think that, and my students think they’re all the ones who are right. Oh, Ehrlich… With friends like him, Mann doesn’t need enemies. Has Mann issued a writ against Steyn for this book and – if it’s wrong, it’s obviously libellous title? If not why not? Oh, let me guess…. The RICO 20 plus MM? Thank you but this from the comments on Amazon is even better. Mr. Paul Ehrlich has a proven track record of being so horrifically wrong, that this review serves as both praise for skeptics and an indictment for Mr. Mann. I cannot be writing this comment, since, according to Dr Ehrlich, I died thirty years ago. Dang! I knew there was something weird going on ! It explains why I feel as if I’m living in the Twilight Zone with all these wacky upside-down “scientists” spouting their loony gloom and doom /hellfire and brimstone “predictions”. “By the 23rd century Earth’s population had reached seven billion. Mankind was in danger of perishing for lack of elbow room—unless prompt measures were taken. Roy Walton had the power to enforce those measures. But though his job was in the service of humanity, he soon found himself the most hated man in the world. It sounds like Ehrlich, a semi-talented science fiction writer, can’t tell the difference between reality and his stories. How are there “remote”sreas of an over populated world? Well stated AW. Sophistry – right on. Excellent word choice! Yes, for Kenji’s sake I hope so. Being struck by a flying irony meter needle sounds dangerous. Does anyone listen to Ehrlich any more? I can’t even work up the necessary curiosity to go to amazon and read the full review. Unfortunately one of his disciples is our current National Science Advisor – John Holdren. Unfortunately Ehrlich was here in Oz at the UNSW giving a talk about something a few weeks ago. However I don’t know how many turned up. Good catch. I’ll bet the irony of that is lost on him. I like his first sentence with ends with “outrageous (he actually spelled it right!) lies.” It makes no sense unless it’s a Freudian slip. Where have I heard something like this lately? I get a chuckle every time this guy opens his mouth. I wonder who read Steyn’s book to him. Did he just say “there is no certainty in science” ??????? Whoops! Damn, you seem very articulate for a dead person. Ehrlich missed his calling to be a science fiction writer. There is more money to be made in fiction writing, and he should have chosen the climate science path. Science fiction, as published by the IPCC? L. Ron Hubbard wrote the manual on how to turn science fiction into a cult religion. The first step is to convince your followers they are special and “more evolved” because they follow your teachings. Paul Erlich is a biologist? Well then, according to AGW doctrine, he is NOT a climate scientist, and has zero credibility or authority to speak as one, or on behalf of one, let alone “all real climate scientists. ” And none of the stupid things he said in the past can be held against them today. Neener neener. He also completely missed the dual crescendo of rock and roll and big hair in the 1980s. This guy could not predict sunrise if he had a Farmer’s Almanac glued to his eyelids. I’m surprised Ehrlich hasn’t died yet — from shame. A scientist who has been discredited by his own statements is coming to the defense of another scientist whose work has also been discredited? Of course they did….it was an error bar so they didn’t see it! Plus or minus two standard deviants. I’d rather believe the original definition but that they were walking OUT of the bar and whatever they had to say was duly noted. Paul Ehrlich — A man who desperately wants to be heard, but has absolutely nothing left to say. Are you asserting that he ever had anything to say that was worth listening to? That is exactly what he would welcome. This is what surprises me about the Pope. How is it he fails to realize that many of the people he listened to regarding climate change are firm believers in the concept of a fixed carrying capacity for the planet. Ehrlich is one of the longest serving deacons in that belief system. Somehow Pope Francis isn’t making the connection that the solutions his science advisors are advocating involving making the poor go away. When they think no more poor, they are not thinking of raising their condition up to developed world standards. They are thinking no more as in no longer existing. I bet he has diagrams for his new gas chambers hidden in his basement !!!! Red Priests are a sad contradiction, more so for the rest of when they gain power…..
Paul Erhlich is just another Timothy Leary whose brain went FFZZZZTT in the 60’s. There was a lot of them. Ehrlich’s review does not contain a single phrase from the book indicating that he has read it. It is just the usual puffery and empty claims repeated so frequently at SkS and RC. Yeah, I noticed that in his “review” also. “Back off man, we’re scientists!”- Peter Venkman. Just like Brandon, copying him above. A stopped clock is correct twice a day, but one which is just plain wrong can easily be wrong forever. Huh. I made a response to this comment, but it apparently got caught in some filter somewhere. As I recall, Ehrlich’s predictions in his ‘Population Bomb’ went through the stage where he predicted catastrophe by a certain date, then when those dates came and went, he pushed the catastrophe back, THEN he tried to spin current non-catastrophic events as evidence of his failed predictions, and NOW says none of it was ever true, but it didn’t matter anyway because it was all about bringing about ‘awareness’. Of what? That you were totally full of it from the beginning? Now does this pattern sound familiar, or am I just crazy? I love Ehrlich’s misuse of commas; “… Micheal Mann, one of the true heroes of climate science, outrageous lies.” He just unwittingly described M the Mann as a unrepentant liar! Delicious! Paul Ehrlich desperately needs an editor. Didn’t he at least give a quick glance at the review he wrote? It’s embarrassing. But, more to the point, I thought people acquired wisdom as they got older. Apparently, however, there’s a certain kind of fixated individual who thinks he knew absolutely everything there was to know back when he was 22 years old, and because his life from that point forward was so luxuriously sheltered from the normal vicissitudes of life, he had no experience through which to learn that he did, indeed, not know everything there was to know. Paul Ehrlich is a case study in that phenomenon. So is Naom Chomsky. They are 2 peas in a pod. Alas, Ehrlich reinvents the No True Scotsman fallacy as “all real climate scientists”. Paul Ehrlich never read the book. Also, he didn’t write a review of the book. He visited the the book’s review page, read OTHER peoples’ responses to Mark Steyn’s work, and talked about that instead from the POV of a CAGW alarmist, populist and kool-aid drinker. Why not actually read the book and be critical? Here is why. Facts don’t matter to the progressive left. They just want wealth redistribution at all costs and Mark Steyn’s personality as well as his book is more influential than Michael Mann (the ex Nobel Prize winner) to the American voter and lobbyist. So Ehrlich is speaking in terms that he is most comfortable with,…. politics and propaganda. Fortunate for me, a nobody. I can objectively ridicule and ostensibly smart man with ease. I read all 80 and some comments to Ehrlich’s review and every single one of them was critical, especially about his numerous failures at prediction. Some are saying he never had a single prediction come true. Even a broken clock is right twice a day. But not one that’s a little slow; slow clocks are always wrong. And that’s Ehrlich’s problem. He’s never able to catch up with the world. Ehrlich believes that Malthus (18th century philosopher) hasn’t been debunked by history. So he keeps on assuming that people cannot adapt and cannot become more efficient. But we do. Time and again he’s proven wrong. But he can’t catch up because he’s tied to an 18th century mindset. Hmm…slow clocks aren’t always wrong. They just need to build up to an almost 24-hour lag to get the time right once. A clock set 10 (or other) minutes behind the real time is never right as is a clock that is set ahead. catcracking, it’s just a question of patience. No clock is precise, so eventually it shows the right time. But the better the clock, the rarer event it is. Paul Ehrlich is probably obsessed with his supposed legacy, just like Obama. Well, being an intellectually sad individual, notorious for getting things wrong, is not the sort of legacy most sane people would seek. Yet, he still keeps on advertising the fact that his opinion is worth absolutely zip? It’s always biologists and social scientists who write ‘limits to growth’ nonsense. They fail to account for the overwhelming factor of human ingenuity that confounds the helpless petri-dish limits envisioned by dystopian linear thinkers. Malthus’s forecast that major cities would be buried in horse manure many metres deep failed spectacularly because of spectacular human ingenuity. These ‘disciplines’ that somehow feel competent to speculate on the future of mankind are totally unschooled and unskilled to engage in this. Biology is essentially dealing with ‘static’ organisms that have limitations and social scientists of the ceteris paribus kind are clearly defining themselves as linear disciplines. We will only be free from this ideologue evil stuff when the population reaches its 8-9B – we are already 80-90% there – and poverty is further reduced and economic wellbeing expanded to cut these unhappy people off. Biologists and social scientists (and, climateers) exhibit a complete failure of imagination. I recall one commenter opining that we must immediately begin to develop sustainable energy sources that can see us through 1,000 years! I don’t think humanity has had a sustainable energy source since we first discovered fire. Yet we’ve lasted the past 20,000-30,000 years. How does that commenter know we won’t be mining energy sources from the moon, Mars, asteroids, or comets within the next 1,000 years? As a philosopher said; our children live in the future which we cannot visit, not even in our dreams. ‘Sustainability’ and ‘Smart Growth’ and ‘High Density Urban Mixed-use Development’ (watch out for these terms in your local governments) – They are policies adopted in your local governments from “officials” that were never elected. In 1992 The UN called it Agenda 21 because it is the Agenda for the 21st century. Yes. 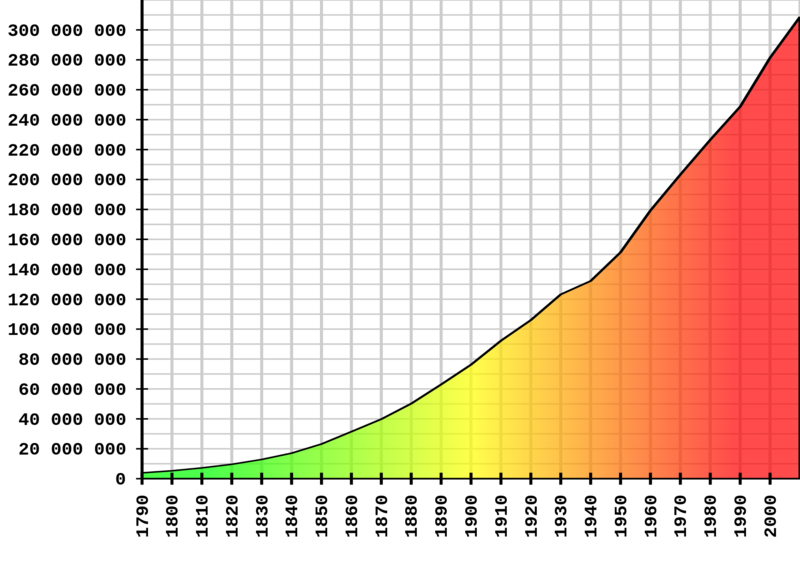 A good example is Moore’s law for semiconductors, which holds that the number of transistors on an IC doubles every 18 months or so. For the past 20 years or so people have been predicting the end of Moore’s law, but the semiconductor industry actually plans on it. Not only do the engineers keep coming up with new ways of making smaller features, they keep developing new kinds of transistors that can be packed tighter and tighter. The biggest barriers to human prosperity are political ones. Nearly ever famine for the past 200 years or so has been politically induced, not naturally. A horse named “Kenjisstorm” is gonna run at Del Mar in about 20 minutes. Right now the odds are 10-1. Mark Steyn noted that he was surprised by the negative comments on Mann from the scientific community. When I read the book, I was astounded by the frank comments of many of Mann’s fellow scientists (although I admit that calling Mann a scientist, based on his behavior, could be considered an affront to true scientists.) However, I am not surprised that well respected scientists would object to the way that Mann cherry picked data by using a statistical selection algorithm which was never meant to be used to select a subset of data and then weighting certain data sets far more than others solely because they aligned more closely with his conclusion. Conclusions are supposed to be developed based on objectively evaluating the data – all the data – not a tiny sub-set. Mann, selected a miniscule sub-set of data which would reduce past warming and enhance recent warming. Then for years he kept his data and algorithms hidden from view except to his chosen team. This is the sort of statistical smoke and mirrors that occurs in DC, but it is certainly not science. Ehrlich, by putting himself on Mann’s side and calling those who question Mann’s methods propagandists has put himself on the side of the Inquisition forcing Galileo to deny the heliocentric nature of the solar system. When your “science” is funded mostly by DC, that is indeed the “science” you get. A real scientist should dispassionately follow the truth. Once a scientist becomes an activist, that scientist has lost the credibility to be called a scientist. Michael Mann is an activist not a scientist. He is clearly trying to prove a point and isn’t following the evidence. At best, he is suffering from bias and is cherry picking the evidence that supports his chosen point of view. At worst, he is a craven fraud. There is always a silver lining in every cloud. Until Dr. Mann tried to erase the Medieval Warm Period I believed in AGW. So, he has created at least one skeptic. “Senior Fellow, by Courtesy” Paul Ehrlich is as strong in French as in everything else. Already have my signed copy. Nobody that is sane that read the book could claim what Ehrlich has said unless they’re just an our right liar. I believe the later is the case for him. But then again that probably goes for most of the alarmists “scientists”. They have sold their souls to the almighty dollar. I’ll bet Ehrlich didn’t realize he had so many well-read fans who commented on his review. Harold Camping predicted – not for the first time – that Jesus would return to Earth in 2011, and certain folks would be taken to heaven in the rapture, …. Paul Ehrlich looks a lot like the late Harold did, and Ehrlich’s predictions are equally wrong. A strong belief based on nonsense is still nonsense. Harold Camping repented of his false teachings near the end of his life. His humility in publicly admitting his wrongs should serve as a positive example to us all: http://www.christianpost.com/news/family-radio-founder-harold-camping-repents-apologizes-for-false-teachings-59819/. Christians should pray for a similar change of heart in both Michael Mann and Paul Erlich. Hasn’t anyone noticed that he called all those scientists critical of mann ‘hacks and has-beens’? That’ll play well with those scientists. Or not. Charles Mackay, on the predictions of Walpole concerning the South Sea Bubble. Did you have to take your dog to the vet to get the wound taken care of? Why didn’t he mention Anthony Watts or WUWT? Are they still on the “do not mention” list? Ehrlich would probably want to rescind First Amendment rights for those that don’t agree with “real climate scientists”, too. really amazed at the audacity of ehrich. but it can go horribly wrong. But then again, for the likes of him, it never has been about the weather, it has always been about excessive population. “Ehrlich” is a German word meaning honest, truthfull. Trust him. Sounds like he’s defiled his family name. That I trust. Anthony, I see that old Malthusian, David Attenborough, has a piece in today’s Telegraph calling Humans a plague on the Earth. Some people just never learn. That he gets away as Ehrlich apparently does, of talking flat-out lies and bs unchallenged, says more about the failed big media model of mass communications than just about anything else could. Attenborough is a complete fruitcake. Er, well, except ‘climate science’ where everything is settled. Other than those little papers that slip out saying ‘oooh, we didn’t know that’. Paul Ehrlich really, really, really needs a thorough biography of him and his career. works, they are heros, if it doesn’t, it was too late! Facts and reality are useless, They BELIEVE!!!! Better screen capture that review. “There is no certainty in science”? I thought the science was settled and certain. Logical fallacy. Not only tou quo que, but also a non sequitur. “Ehrlich” in German mean “Honest”, which would make his contribution doubly curious. So curious in fact that I surmise that the “Ehrlich” writing the comment is not Paul but a false flag imposter. I’m guessing he figures the science was declared settled by the referees around then so there’s no need to include later data. “This review is a joke, right? For what it’s worth, my advice to anyone suffering depression is the pills only work for a short time as a circuit breaker while you get your excrement together. The anti-deps I was on really REALLY SC$%ED me up… I don’t recommend them to anyone. Lost in the first edit / update. A dis-recommendation by Ehrlich? Quel honneur! Is there any more notorious has-been “futurist” than Paul R. Ehrlich? Given his own past success as a fiction author, it can be no surprise that he would ardently admire Mann. Is Paul Erlich still alive? I thought he had starved to death with the rest of us. Or was that just for the lumpenproletariat? I am pretty sure it is a pretended review. There is nothing in it indicating he read the book. Anyone out there know where to find cold hard facts on the real state of the parameters that people say are indicative of climate change? I hear of ice caps melting or growing, tornados and hurricanes either more or less frequent or intense. Droughts, wild fires, the list goes on. This should be a lot easier than it seems with all the Galileo-like atmosphere surrounding the issue. It would be helpful to have a CAGW-Claims-Refuted Summary page, though. Looks like I missed the obvious. Interesting that Erlich actually admits “there is no certainty in science …” Except for the “consensus” on catastrophic warming. The pot calls the kettle white. No, there’s another pretty obvious possibility (likelihood): Steyn rightly assumes there’ a correlation between regional and global temperatures and he felt it’s the perfect quote to start his book even if it wasn’t perfect from a scientific point of view. And your attempt to hold Mark Steyn, someone who literally identifies himself as an entertainer, to the same principles as a professional scientist whose (faulty?) work has been used as the basis of international treaties and government climate policy around the world is laughable. Steyn is defending himself from an attack by a professional scientist; it’s not two professional scientists debating each other. There is no reverse onus on Mark Steyn to hold himself accountable to the highest scientific standards. That standard *only* applies to Mann in this case. Your analogy is the equivalent of comparing John Stewart or Stephen Colbert to a network news anchor. 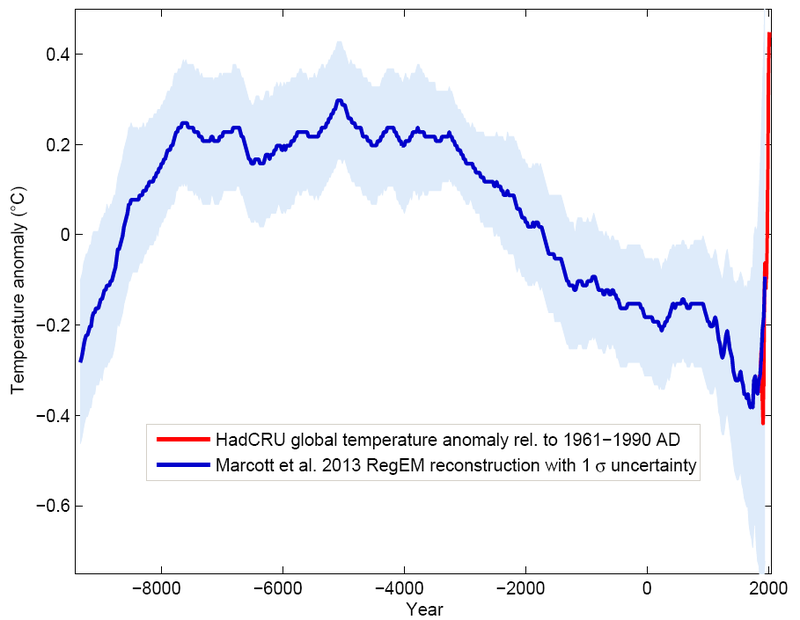 “Over the last 10,000 years it has been warmer than today 65 per cent of the time”. The lesson? Never believe a believer without checking the facts first. I’m not sure why I bothered, but I briefly checked out Brandon Shollenberger’s blog (sorry, comment section only he can post in) supposedly dissecting Steyn’s book. I didn’t get past this gem: . Ummm, is this genius actually publicly announcing he pirated a copy of Steyn’s book? Way to take the high ground Brandon. What a goof. I would say that Steyn is near the truth. We have been in an interstadial/interglacial for the last 10,000 years. Bar some shorter mini ice ages. After the second world war, my mother (RIP) blamed England’s colder summers and winters (1947, 1963 particularly) on H Bomb tests and the number of bombs going off. Without sufficient rain fall and warm seasons we could not have developed agriculture and domesticated animals. So why nit pick? Comedy central from academe but I feel our learned perfesser may be donning a suicidal vestment here. Still you never know nowadays and perhaps he’s got the inside running and the Green loons have secret plans to replace all the Oz gum trees with some wonder fireproof ethanol plant.